When I finished the book, I immediately emailed the author and asked for more. This book was well written. My rating would be a WOW. The characters were believable in a fantacy word. As an adult I was engrossed in the story but I think young adults and teen would love it. In fact I bought another book for my young friends. I loved the cover and, by looking at the twins you can understand how this story could be believable. If you love battles, this book has a whopper. 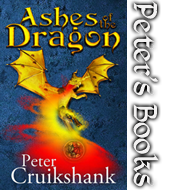 If you don’t become a fan of Peter Cruikshank and the Dragon Called Legend you’re missing out on a great experience. Dont’t miss out. Happy reading…..